Fr Michael McCabe, SMA Provincial Leader, preached at the Funeral Mass for Fr Eamon Kelly at St Joseph’s SMA Church, Wilton, Cork. Fifty-two other priests concelebrated the Mass with him. These promises, taken from the Scripture readings we have just heard, sustained Eamon throughout his life – a life that was marked by frequent bouts of ill-health, which prevented him from achieving all he would have wished to achieve. His faith in the Author of these promises kept him remarkably cheerful and resilient, even at the darkest times. Never one to complain, Eamon radiated a positive attitude which lifted the spirits of all who knew him, even though most of them had far less burdens to carry than he had. Eamon was a missionary above all by the witness of his life, by the manner in which he related to everyone he met. In his famous Encyclical, Evangelii Nuntiandi, Pope Paul VI stated that, in our time, witness of life is the primary form of mission. “Modern man listens more willingly to witnesses than to teachers, and if he does listen to teachers, it is because they are first witnesses” (no. 41). Eamon did not believe much in teaching. His philosophy, as expressed it in an interview he gave to Helen Corley, a journalist working for the Westmeath Independent is encapsulated in the pithy statement of Galileo: “You cannot teach a man anything: you can only help him to find it within himself.” Eamon had a way of affirming people and drawing out the best in them. He now goes to meet the One in whom he had placed his trust, the One he served all his life, and who now welcomes him into the blessed company of the saints to experience the glory ‘as yet unrevealed’ which we one day hope to share. In this context then, we recall some moments from his life with us. Born in Baylough, Athlone, on 1 February, 1936, Eamon was the youngest of family of four, three boys and a girl, to John Kelly and Josephine Kerrigan. His early education was at St Peter’s Infants’ School, Dean Kelly Memorial School, the Marist Brothers, Athlone, and Summerhill College, in Sligo. 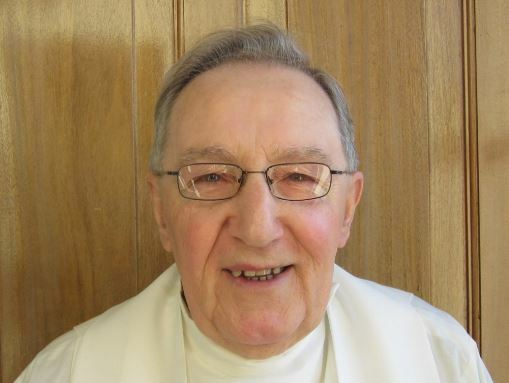 Responding to the call to offer his life to the Lord as a missionary priest, he joined the SMA Novitiate in Cloughballymore, Co Galway, in 1954, taking his first oath in the Society in June the following year. He pursued his programme of initial formation for missionary priesthood – including studies in Philosophy and Theology – in Wilton, Cork, and at the Major Seminary of the Irish Province in Dromantine, Newry, Co Down. He took his permanent oath of membership of the Society on 15 June, 1960, and was ordained, along with 21 of his classmates, by Bishop Eugene O’Doherty in Newry Cathedral on 21 December, 1960. This class was the largest class of ordinandi in the history of the Irish Province. Following his ordination, Fr Eamon was appointed to the then Prefecture of Ilorin, Nigeria. Never blessed with robust health, Eamonn got seriously ill less than two years later and returned to Ireland to recuperate. While recovering he served as Dean of Novices (more a companion than a dean) in the SMA Spiritual Year Programme in Cloughballymore, Co Galway, from 1963 – 64. During his time there, he was also my Dean for a few months – and a gentler, kinder Dean you could not have asked for. Unfortunately, Eamon became ill again towards the end of 1964 and required a further period of treatment and convalescence. He made a good recovery and was able to return to his mission in Ilorin in October the following year. He ministered in number of parishes in that Prefecture, later a diocese, notably, St Joseph’s Cathedral Parish, Ilorin, where he was administrator. He learned both the Hausa and Yoruba languages and built up the Christian Communities in that vast diocese – more than half the size of Ireland. Wherever he worked, Eamon endeared himself to the people he served who held him in the highest regard. In June 1978, another bout of illness forced his return to Ireland, where he took a Sabbatical programme at the Liturgy Centre in Carlow which he thoroughly enjoyed. In June 1979, still unable to return to Nigeria for health reasons, and following a few months of pastoral Supply work in St Joseph’s parish, Brighouse, West Yorkshire, Eamon took up an appointment in his home diocese of Elphin from October 1979 to December 1982. Over that time, he ministered in the parishes of Ballinaheglish, Kilmactranny and Ballinagare, where he was well-liked by the priests and people he served. During his years in the Ballinaheglish, Eamon also taught Religion in the Roscommon Vocational School. In August 1983, with the missionary itch still tugging at his heart, Eamon returned to Ilorin diocese, serving there for the next five years in the parishes of New Bussa, Ekan Meje, and Offa, all of which had a large number of outstations. In October 1988, ill health struck him again – heart trouble this time – forcing his return to Ireland. On his return he was admitted to Mater Hospital, Dublin, for a quadruple by-pass operation. Following this operation Eamon was, unfortunately, never able to return to his beloved Nigeria. Nevertheless, he continued to minister as a priest in England and Ireland from 1989 until his retirement to Cork in 2012. During this time, he served in Our Lady of Sorrows Parish, Knutton, in the diocese of Birmingham, in the SMA parish in Wilton, Cork, as well as in Clonfert diocese. From the mid ‘90s, he spent many years in Athlone, taking care of his brother, Jude, who was seriously ill. Over these years, while receiving treatment for cancer himself, Eamon continued to help out in several local parishes, as well as being Chaplain in the Mercy Convent, Summerhill, Athlone. In 2012, requiring more regular nursing care for his deteriorating health, Fr Eamon retired to our House in Blackrock Road. Here, too, he endeared himself to all around him and to all who came into contact with him: his confreres; the staff of Blackrock Road, especially the nurses and Staff of St Theresa’s unit who took great care of him. Until very recently, and in spite of frequent visits to the hospital, he continued to engage actively in the life of the community. His excellent baritone voice enhanced the community’s celebration of Mass and, for as long as he was able to stand, he took his turn in leading the 10.30 Mass. Right up to the end of his life, Eamon retained his positive and cheery disposition. Visiting him in his room was always a pleasure as he was grateful for even the smallest favour. One could not but feel the better for stopping and having a chat with him. If there was one virtue that Eamon possessed in abundance it was the virtue of gratitude, described by Cicero as ‘not only the greatest of all virtues, but the parent of all others’. This he combined with an endearing simplicity of heart. Not that Eamon was naïve – though some might say he was – but he preferred to see the best in everyone. He was also a man of great compassion, whose personal sufferings had opened his heart to the sufferings of others. Just over a year ago, Pope Francis, in a famous TED talk – the first given by a Pope – stated that what the world needed most of all today was ‘a revolution of tenderness’ to counteract the cruelty, violence, competitiveness, inequality and exclusion that is so prevalent. Eamon’s entire life resonated that message. A dimension of Eamon’ life that I had not been aware of until about four years ago was his interest in theology. One of his favourite books was Antonio Pagola’s Jesus: an Historical Approximation. I can tell you that this book of over 500 pages is not light reading and it is certainly radical. Another book which Eamon lent me to read a few years ago was The Christlike God, by Anglican theologian, John V. Taylor’s – a profound and challenging reflection on the God revealed in the face of Jesus. What both books underline is God’s limitless compassion – a quality I believe Eamon strove all his life to emulate. These books reflect the serious, enquiring, reflective side of Eamon. However, Eamon also loved a bit of fun and banter. He enjoyed social occasions and was always ready to share a song of a joke on such occasions. I believe he also enjoyed the game of golf for many years. He who called thee will grant thee. To bloom again thou art sown!